Thanks to a joint rivet closer to the blades, Platinum Tools' cutting pliers redirect force better than other pliers. 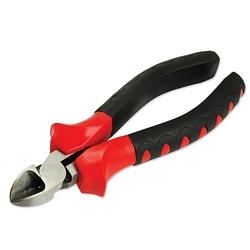 The stainless drop-forged chrome-vanadium steel jaws use induction-hardened cutting blades that will not nick. The non-slip cushioned grips can help prevent hand injuries and fatigue.